In order to provide students with supplementary, consumable materials, Schilling Farms is accepting a $25 instructional fee for each student in preschool through 5th grade. 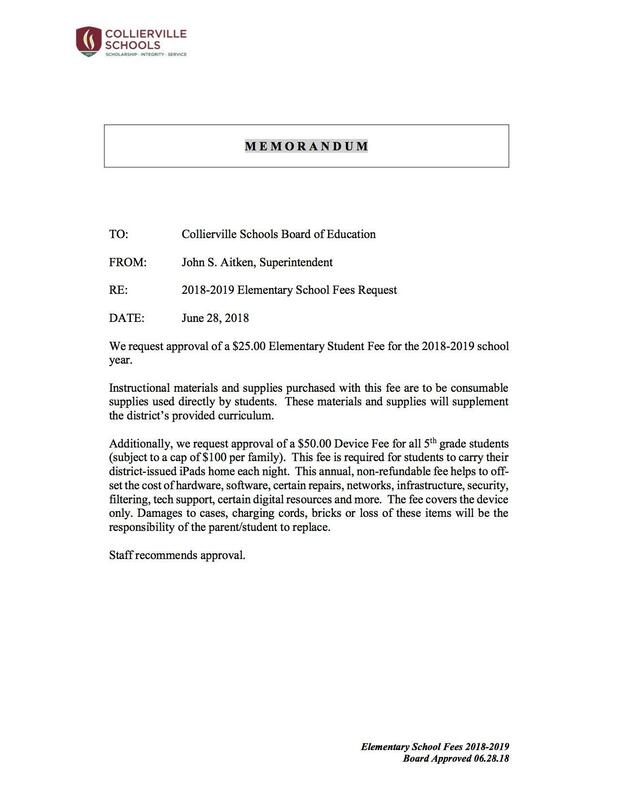 In addition to this fee, 5th grade students will also have a $50 technology device fee in order to be able to carry their iPads home each night. This will cover any damage that may happen to the device itself. (Please see the letter below for more details about these fees.) Both of these fees can be paid online or by cash or check. If you would like to pay these fees online, please visit https://osp.osmsinc.com/ColliervilleTN/. Once you click the link, you will need to select Schilling Farms Elementary School from the menu of elementary schools, and select the $25 instructional student fee (all students) to add it to your cart. In order to pay the $50 technology fee (5th grade students only), you will need to click on "Central Office" at the top of the screen, click on "Technology," and then select the appropriate technology device fee based on the number of students you have in 5th through 12th grade. Once you have all the appropriate fees added to your cart, you can check-out by clicking on the shopping cart at the top right of the screen. If sending in cash, please place money in an envelope and label with your child's name, teacher's name, and purpose for the payment (Ex. instructional fee, tech fee, etc.). If sending in a check, please make the check payable to Schilling Farms Elementary School or SFES and include your child's name, grade, teacher's name, phone number, and purpose for the payment (Ex. instructional fee, tech fee, etc.). We would love to have these fees collected by the end of September if possible. Thank you for your support!